OST Trucks & Cranes also maintains a “Zero Tolerance Policy” with regards to Drugs & Alcohol in the work place. Each and every employee is not only trained initially on our drug and alcohol policy but also when changes are implemented in accordance with our policy and also each and every year after on their date of hire. Awareness training and supervisor recognition training is also provided in accordance with our policy. With an average length of service of 15 years with the company, each of our crane operators are certified by the Southern California Crane and Hoisting Certification Program and are among the best in our industry. Our crane operators are also trained in proper job setup, emergency procedures, rigging and safety practices, communication, load dynamics, lift planning, critical lifts and a host of other mission essential safety policies and procedures. Each of our operators and oilers are also members of the Operating Engineers Union, Local 12. Every OST employee goes through a very rigorous safety training program before they do ANY work for our company. 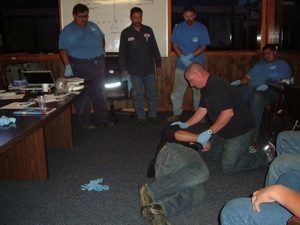 While a majority of this training comes from within our own safety department, some of this training is provided by outside sources. Outside sources are used to help us ensure we are staying current with all of the new federal, state, and local rules and regulations, policies and procedures.